I don’t know much about cars. 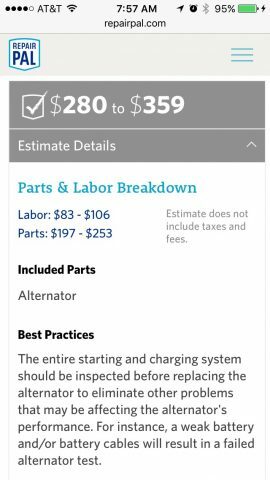 When the mechanic says “You need a new alternator” all I can say is “OK… but how much is this going to cost?” At that point, as long as he doesn’t say something outrageous I tend to give him the go-ahead. Then I spend the next few weeks wondering how much I overpaid. Those days are over (and they have been for awhile). RepairPal.com, a terrific resource, helps you get an idea of what your particular repair ought to cost, based on your car’s make, model, and year. It also takes your location into consideration. 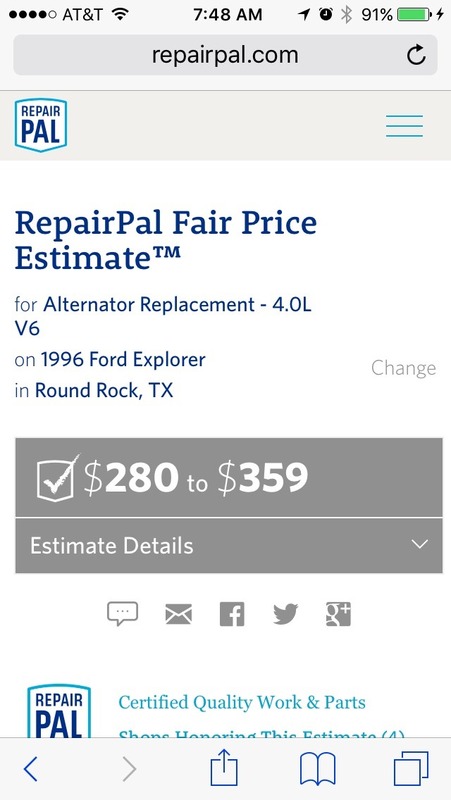 NOTE: RepairPal used to be an iPhone app, and it was terrific. However, the RepairPal people have focused their attention on their website, so that’s the way you’ll be accessing the RepairPal service. 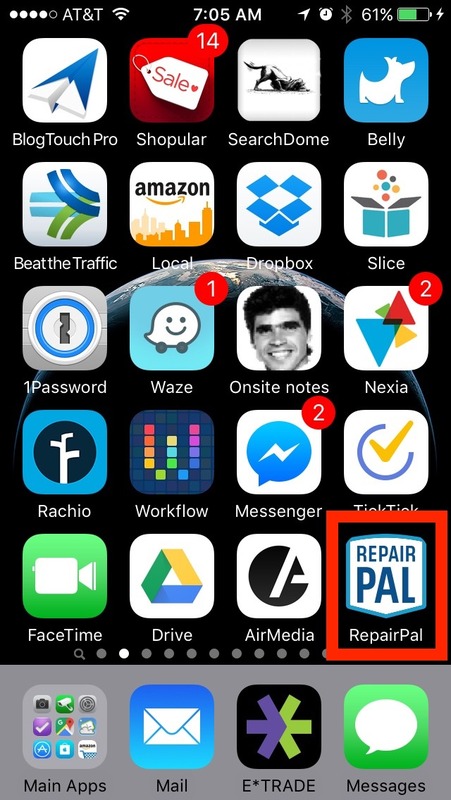 In the years since I first used their iPhone app RepairPal’s done a ton of work: certifying repair shops, forming partnerships with groups including AARP, Consumer Reports, and the non-profit Automotive Service Association. 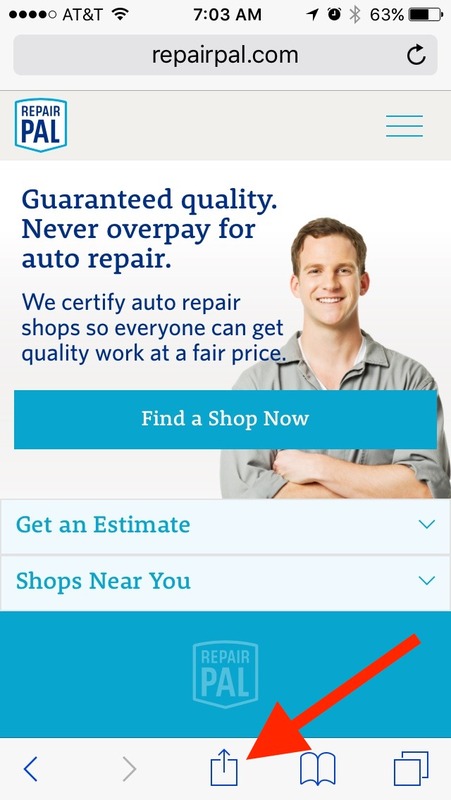 Here’s how RepairPal.com looks when you bring up repairpal.com on an iPhone. 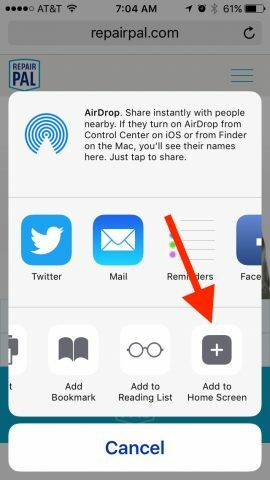 If you tap on the “Share” button (red arrow points to it) you can add a RepairPal icon to your iPhone, and since it looks like an app for all practical purposes, there’s your RepairPal app. 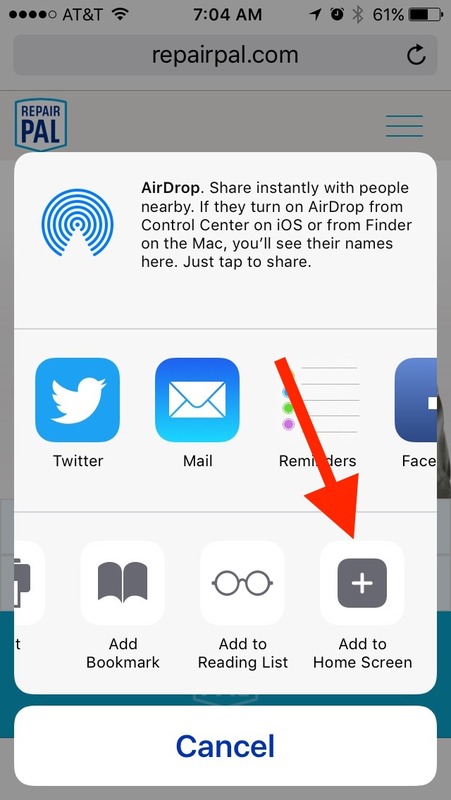 Look for “Add to Home Screen,” tap it, give the thing a good name, and you’re done. 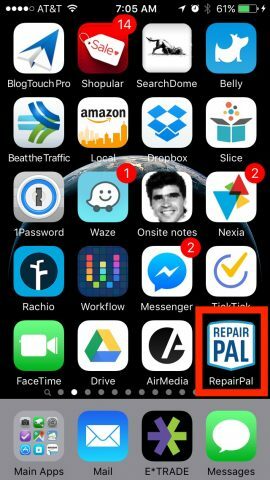 Now RepairPal is just a tap away. Suppose your car is a Ford Explorer, 1996. Suppose the mechanic tells you it’s time for a new alternator and that it will cost you $300. 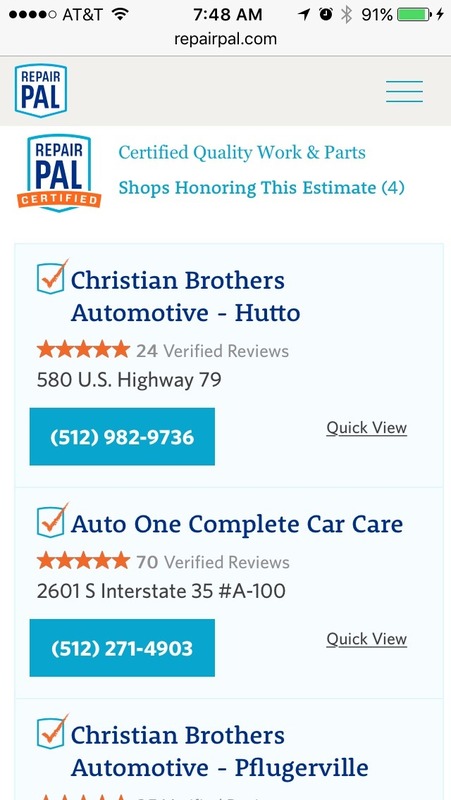 Start up RepairPal, tap “Get an Estimate,” put in your car’s info, and then your location, as shown below. 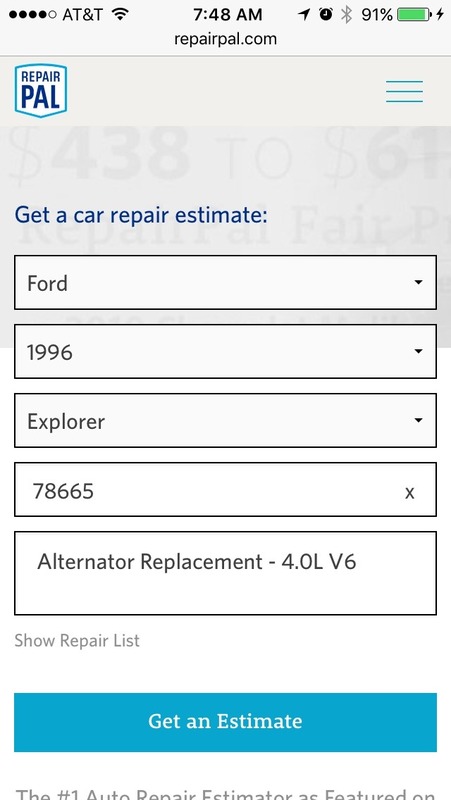 Then touch the blue “Get an Estimate” button. Here you see a range of prices, a little bit higher at the dealers and a little bit less at the independent shops. 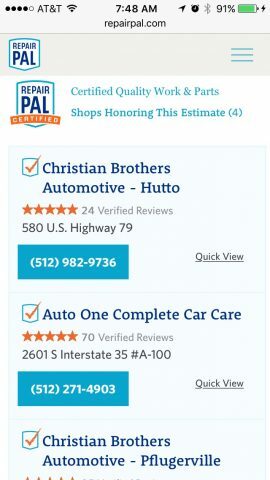 Now you know enough to evaluate your mechanic’s quote. Tap “Estimate Details” and learn about the repair. Close up the Estimate Details and scroll down to see a list of places that can handle the job. They even have ratings. Knowledge is power. In a way, I’m sort of looking forward to having something go wrong with my car so I can pull out my iPhone and turn to RepairPal. Note: you can use the repairpal.com website from your desktop Mac also– this is not an “iPhone only” thing. You ought to have a look at it that way as there is a lot of information on the site and it might be easier to read it on the bigger screen. Best part about this was learning to add icons to screen on my iPhone. Thanks, Dude.